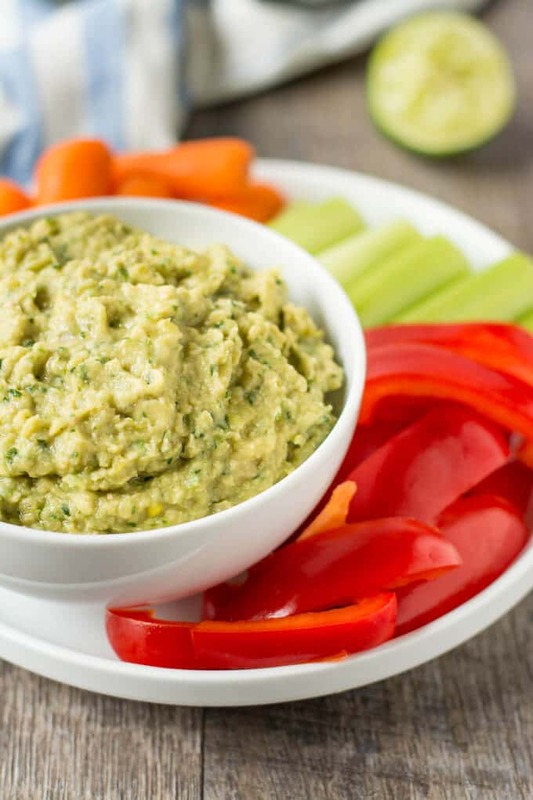 This Cilantro Jalapeño Hummus makes a easy and healthy snack. Serve it with pita chips or you favorite veggies! I got inspired to make this the other day after having dinner at Panera Bread. My husband ordered their Mediterranean Veggie Sandwich, which had a cilantro jalapeño hummus on it in place of a standard sandwich dressing. I tried a bit of it, and it was one of the most delicious sandwiches that I have had. I decided to try to come up with my own version of the sandwich at home. I thought about just buying a store-bought cilantro jalapeno hummus, but decided to try and make my own. Making your own means you can adjust the ingredients to suit your own taste. I know that it is traditional to use tahini in hummus, but it’s not something I keep on hand. Plus, I think that it taste just as good without it. I am not claiming that my version taste just like Panera Bread’s hummus, but it is quite tasty. Lately, I’ve been making this just about every week as a dip for raw veggies. It’s one of our favorite healthy snacks before we go for a walk or bike ride. Whether you use it as a sandwich spread or a dip, it’s totally delicious! 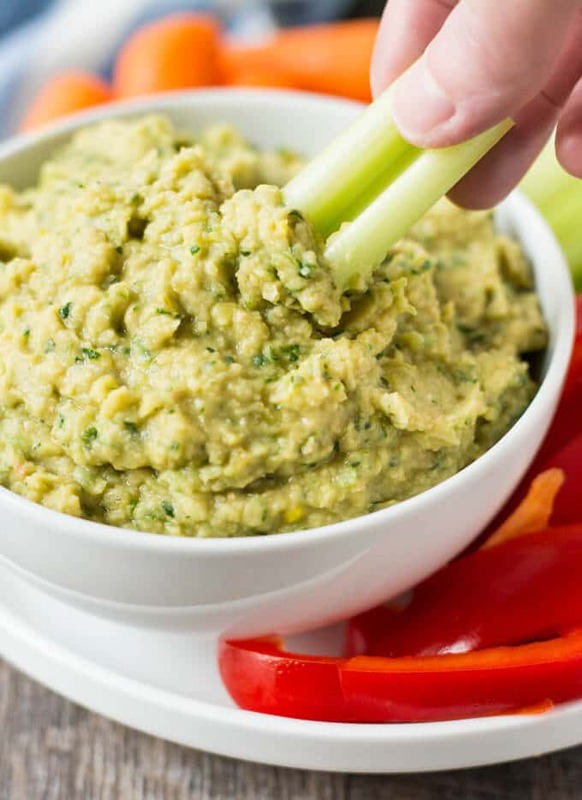 This Cilantro Jalapeño Hummus makes a delicious and healthy snack idea! So easy to make! Place the garbanzo beans in the food processor, and pulse a few seconds to break up the beans. Scrape down the sides of the food processor as needed. Add the red onions, garlic, and jalapenos- pulse a few seconds more. Add the lime juice, olive oil, cumin, cilantro, splash of water, and salt. Process until smooth and creamy, scraping down the sides of the food processor as needed. Depending on the consistency you prefer, you can add an extra splash of water if you'd like. By Tempie at November 16, 2018 . 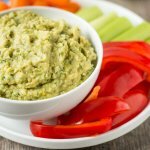 Cilantro Jalapeno hummus is one of my favorites! I haven’t had in a while- might need to whip up a batch. I LOVE that you don’t use Tahini. I never put it in my humus because I think sesame is gross… and let’s be honest, who can go through a jar THAT big before it goes bad, anyway? My favorite thing to add to humus is Taco seasoning. people love it and can’t seem to ever place the flavor. Lastly, I am kind of cracking up that you made this because of the Panera bread sandwich. I just decided- I am sick of throwing away my money buying that- I’m going to go home and make my own! Hi Nora! I know what you mean. I did buy some Tahini back when I first started making my own hummus, but I couldn’t use the whole jar up before it went bad. I didn’t think it made the hummus taste any better, and it’s just plain cheaper to make it without it.